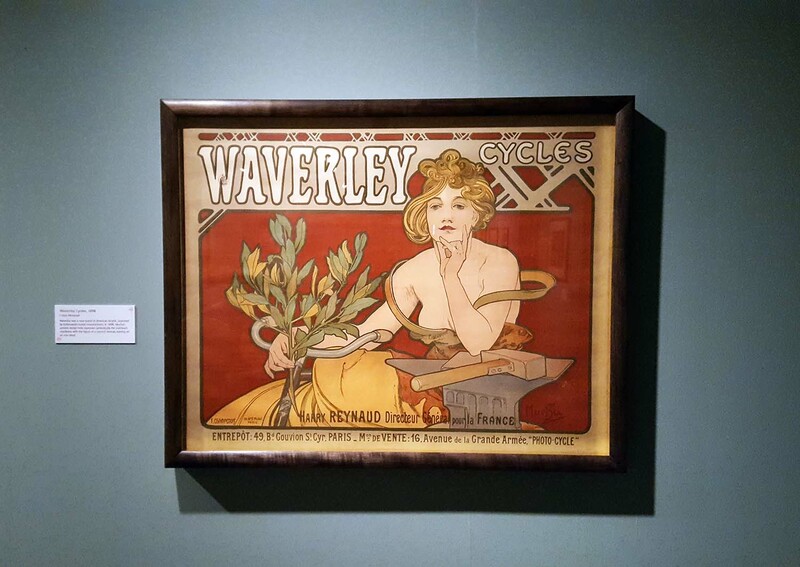 As soon as I heard about the Mucha exhibition at the Kelvingrove Art Gallery, Glasgow, I couldn't wait to go. 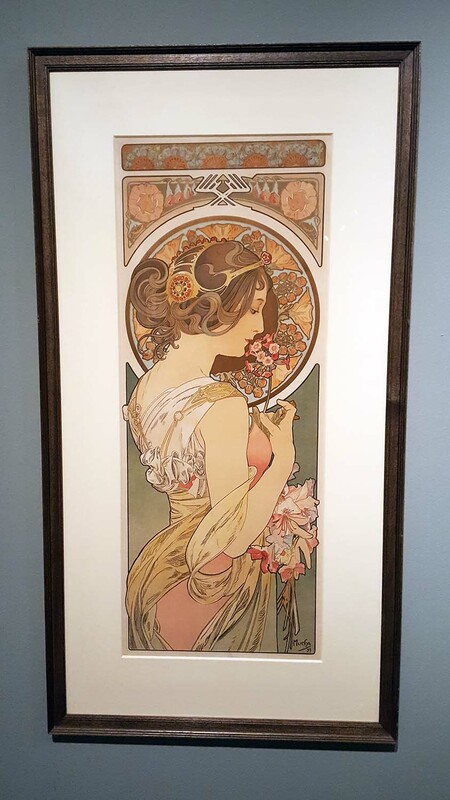 I feel so lucky to have had access to Mucha's body of work right here on my doorstep, but I also thought I knew his work pretty well already. Nope. The revelation of the 'Q' formula was huge for me, and ever since my visit I've been seeing circles and 'Q's - and circles that could be Q's - in everything. The circle of life. The eternal circle. The face. The cyclical nature of life and death, of the seasons. All of those things. The distinctive design incorporates the mystic signs of the zodiac, motifs from nature, elaborate jewels and a prominent halo to make associations with lavish Byzantine religious art." I bought the postcard, however my own sign (Pisces) is not fully visible. I wonder what sign Sarah Bernhardt was? I did know about her. One can say that rarely has someone's soul been more faithfully exteriorised... Every feature of her face, every movement of her clothing, was profoundly conditioned by her spiritual need." 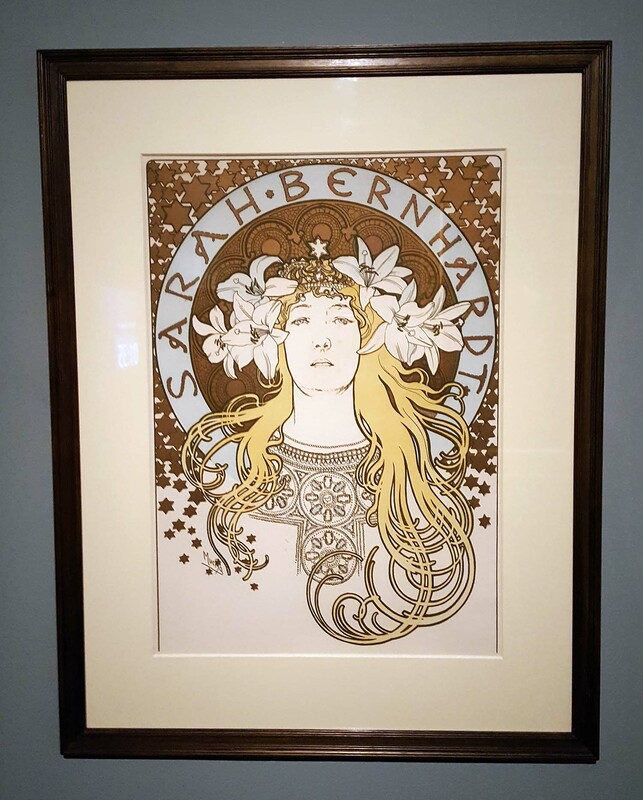 Mucha's friendship with Bernhardt gave him in-depth knowledge of her theatrical expressions, but all of his women with their decorative halos appear like secular Madonnas." 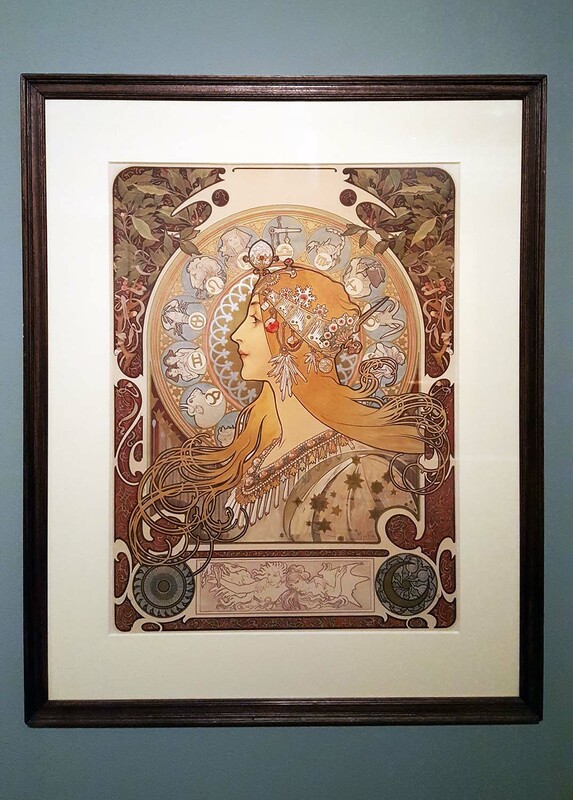 Mucha believed that beautiful works of art elevated people's morale and improved the quality of their lives. 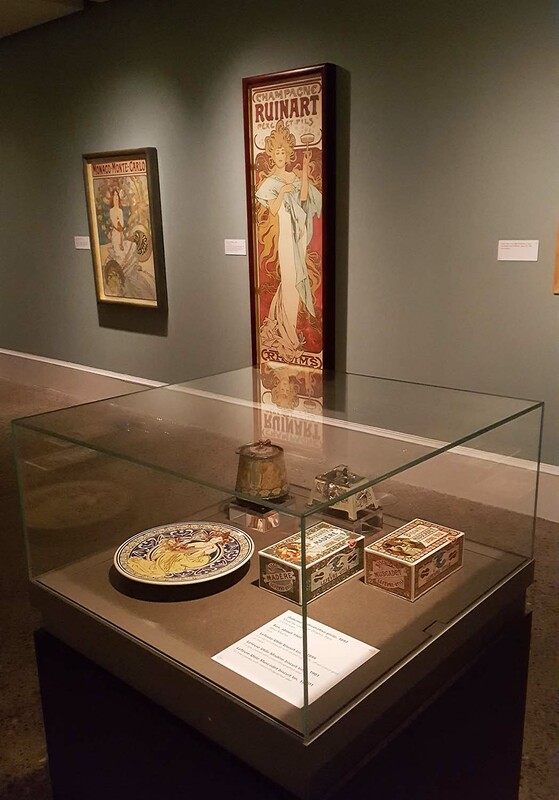 His design formula, known as 'le style Mucha', became a visual language for communicating his message of beauty." 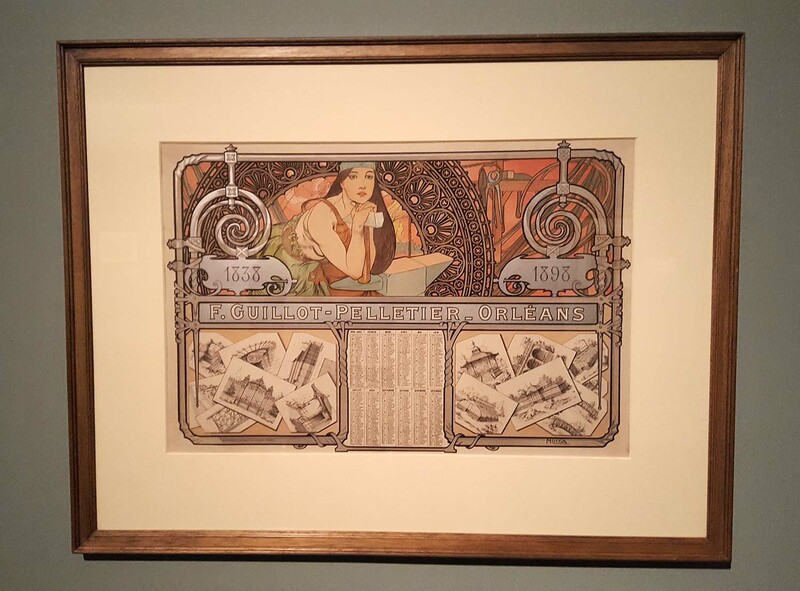 How I loved reading that: Mucha was a man of the people: "I was happy to be involved for art for the people and not for private drawing rooms... it found a home in poor families as well as in more affluent circles." 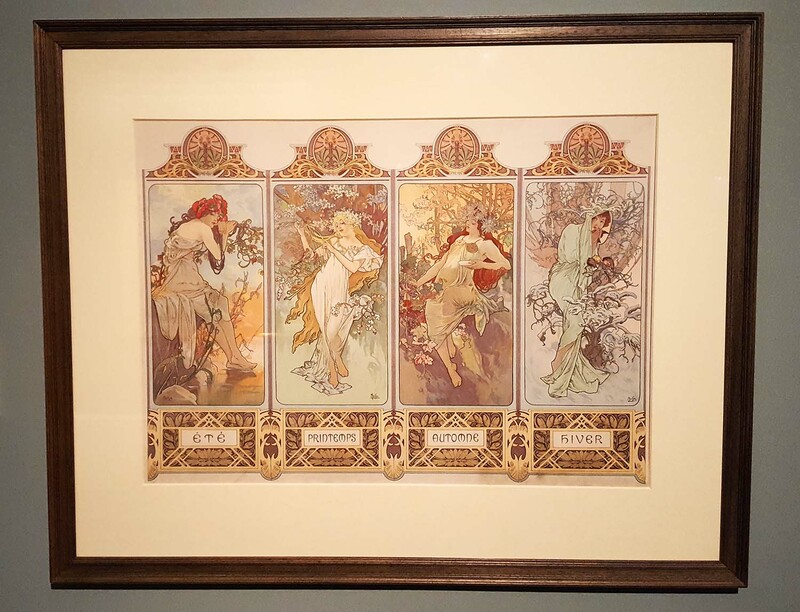 And by pairing each of the Arts with a natural motif - for example birdsong alongside music - Mucha emphasises the contribution of nature to creative inspiration. The marvellous poem of the human body...and the music of lines and colours emanating from flowers and leaves and fruits are the most obvious teachers of our eyes and taste." These ladies seem like forerunners to Mary Cicely Barker'sThe Flower Fairies, albeit more worldly, more spirited, similar to those in 'The Seasons'. Could I dare to call them nymphs? 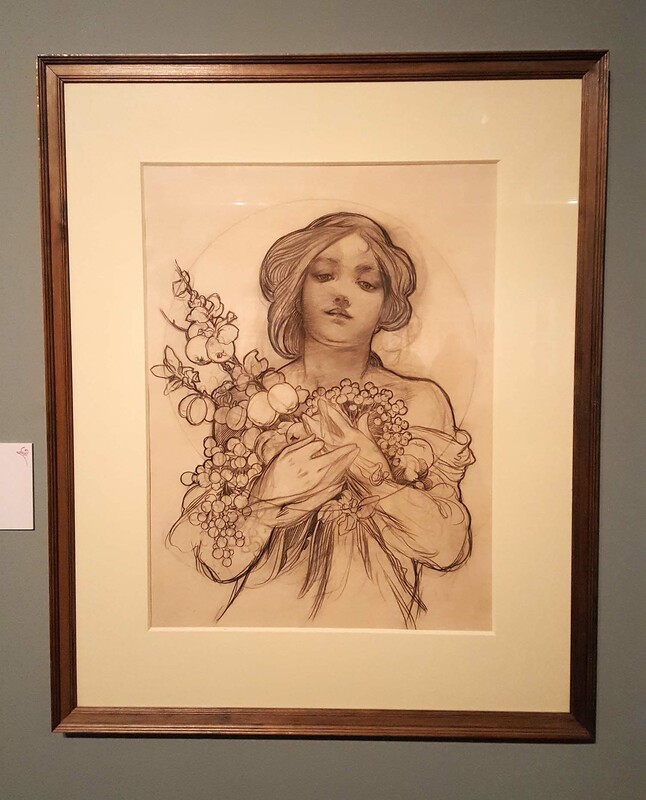 Women remained central to the composition of Mucha's later works, but they became spiritual symbols... [Below] The woman holds primroses, which enhances the sensory nature of the design." 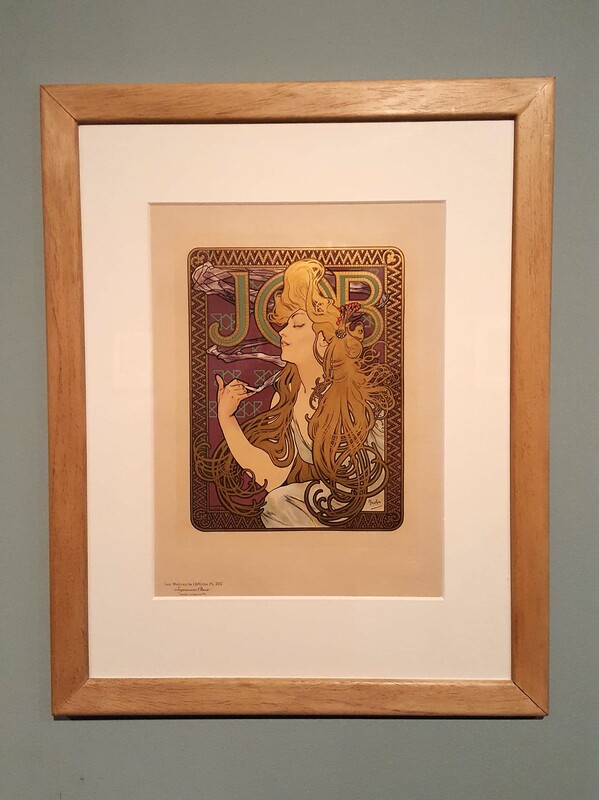 Mucha's advertising posters reflect the rich texture of modern life in La Belle Epoque, Paris (one of my favourite periods in history). The subjects range from diverse consumer products, to cultural events and tourism. Incorporating decorative motifs and allegorical elements, central to all these compositions is the female figure, alluring potential consumers with her beauty." 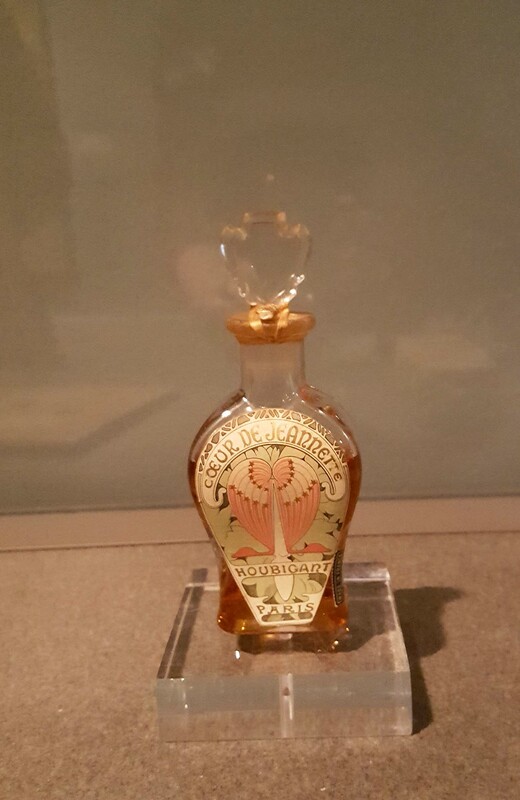 There are hints of William Morris's swirling floral and leaf repeats and the work of Charles Rennie Macintosh, both of whom played a part in the emergence of the Art Nouveau design movement that swept across Europe. I particularly loved the contemplative, far-away gaze of the lady below. I think she's my favourite. Maybe she's bored, or simply resigned to her fate? She's advertising a bike and it looks like the kind of item she would need - or want - the least. Where is she taking her leaves (sage?) and: is that a hammer? As I left, lingering long in the exhibition shop along the way, my mind was abuzz with Q's and circles and tendrils. Flowers. Nature. Pastels. Red. Gold. Thorns. Daisy crowns. Primroses. Stars. 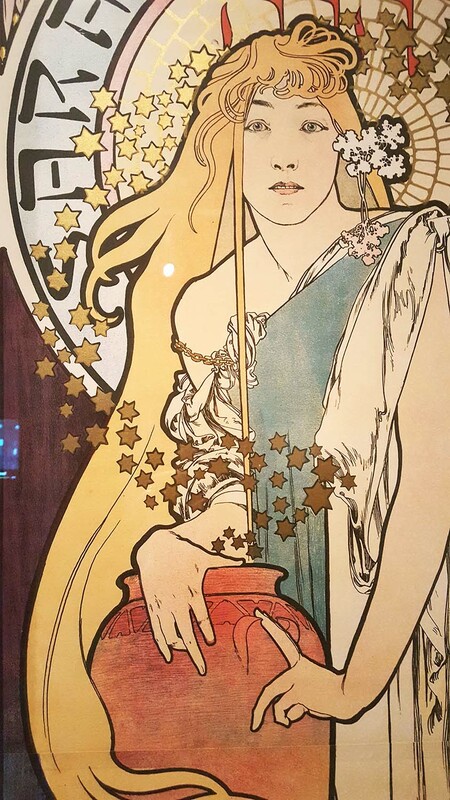 These symbols return over and over again in Mucha's art and I love that instantly he was able to manifest his signature style. Surely that is every artist and creatives' dream? A picture I believe, acts aggressively. 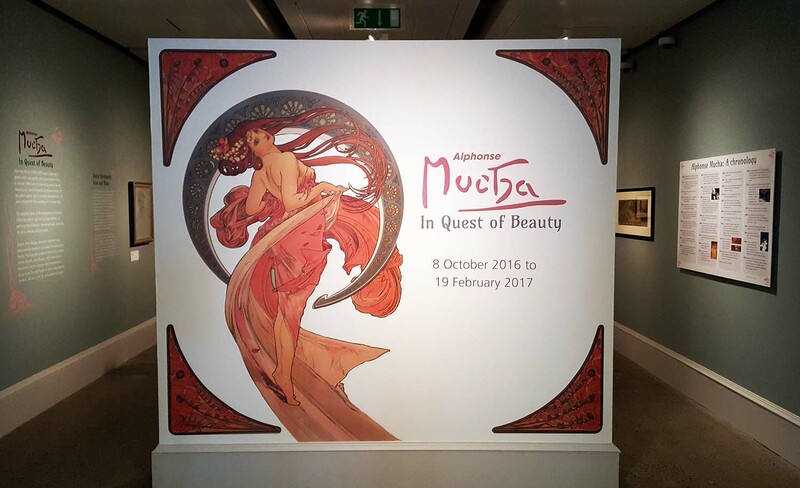 Unhindered it penetrates through the viewer's eyes into his soul"
Mucha: In Quest of Beauty runs until 19th February 2017 at Kelvingrove Art Gallery & Museum, Glasgow, Scotland. I was delighted it was permissible to take photographs (no flash) throughout the exhibition, however the lighting was low to protect the original pieces which has affected the quality of these images. A photograph can never hope to be as good as seeing the art in person, but I hope it gives a flavour of 'Mucha in Glasgow', and what to expect for anyone planning a visit themselves, or for those further afield.